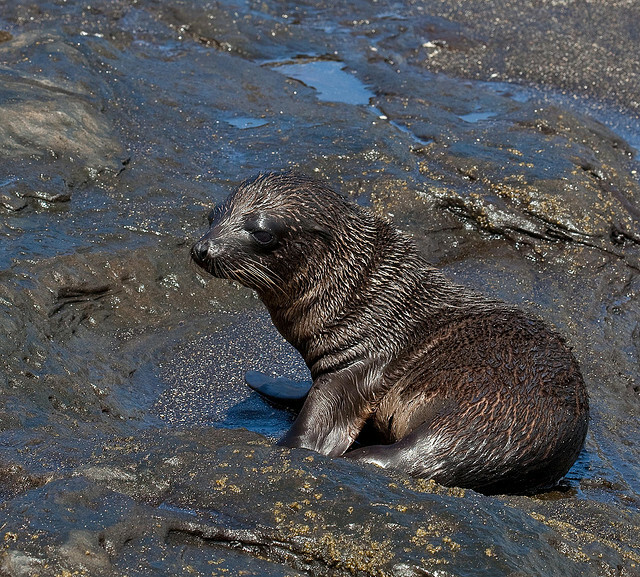 Here's what a casual sea-lion observer would register: a pup is born and starts to suckle. Not long thereafter, the mother goes out to sea for days at a time in order to eat and gain strength so that she can return to the pup to nurse it and help it grow strong and, ultimately, independent. 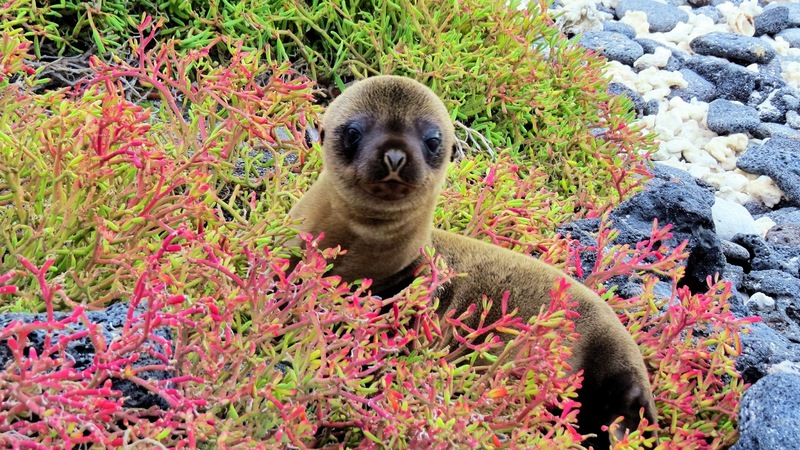 That's why so often as we walk on the Galapagos Islands, we see these little ones on their own, sometimes in little nurseries, often going from one female to another looking for their mom, and just as often crying in apparent frustration. Soon enough though, the mother sea lion returns, finds her baby and gets back to the business of feeding and nurturing. This general behavior applies equally to male and female pups. What the latest research has disclosed is that offspring of both sexes nurse for at least two, and often as many as six or even seven, years. The scientists call the nursing period of sea lions a "boomerang system." This means that they often suckle even after having pups of their own and after the mothers have new babies. Interestingly, this results in the possibility that more than one generation at a time may be suckling and the older offspring may edge out the younger for their mother's milk supply. This is where the behavior of male and female sea lion pups diverges. Following the initial suckling period, the little females nurse only intermittently and learn to hunt and fish on their own. They start early to get their own nutrition. Their independence provides learning opportunities and experience. Equally important, this independence relieves some of the burden on their mothers. The little males, to the contrary, keep on nursing and don't lift even a flipper to find some of their own food. The result is to place the full burden for their growth on their mothers. According to the scientists, this dichotomy between the males and females - particularly the resultant wear and tear on the mothers - raises "questions about the evolutionary costs for mothers of rearing such lazy sons." To understand these potential evolutionary costs, the entirety of a young male sea lion's drain on his mother comes into play. 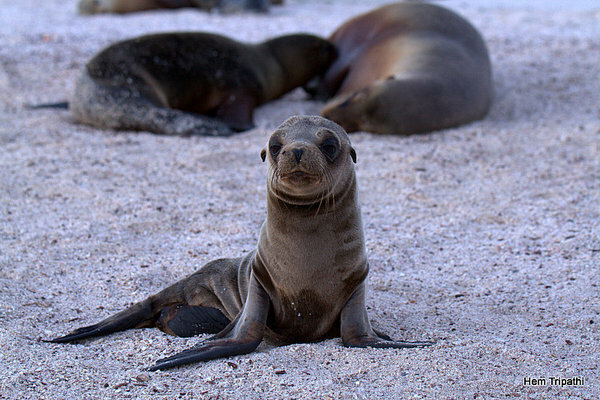 The male Galapagos sea lions outweigh their female counterparts considerably at birth. To maintain that weight and to continue to grow they need a lot of calories. This places an extreme demand on the mothers to go out to sea and fish their hearts out! They need enough nutrition to feed themselves as well as their growing boys. And, it should be obvious, as the boys grow, they need more food - thereby continuing the cycle of feeding and eating, depleting, hunting and starting all over again. It's an arduous process for the mother. 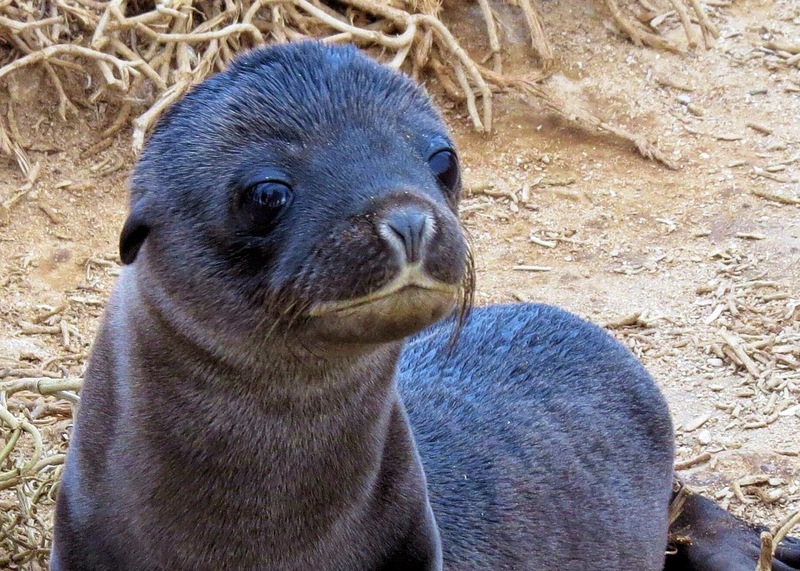 It also may help explain why a nursing sea lion mare will feed only her own pup, no matter how needing and demanding another may be, even an orphan whose own mother does not return from a fishing expedition. The findings reported in Animal Behavior were utterly unexpected. Until this study, marine biologists, knowing how much more calorie consumption was needed by the males, had assumed that their nursing intake was supplemented by their own hunting. Finding that the males do not, in fact, forage nearly to the extent of the females was eye opening. To confirm their expected hypothesis, scientists glued devices to the backs of one and two-year old sea lions. The devices tracked the distance from home and depth in the ocean traveled by the little ones. The results were interesting to say the least. By the time they were a year old, 81% of females, but only 46% of males, were diving regularly on their own. And by age two, the girls were traveling as far as 18.6 miles from shore on all-day hunting trips, diving as many as 52 times a day. What about their two-year old male peers? They never traveled more than 219 yards from the colony and spent only a fifth as much time diving. Instead, they played with their friends on the shore and waited for their moms to "bring home the bacon." The study's author told this story of his observations: "We always saw the [young] males around the colony surfing in tide pools, pulling the tails of marine iguanas, resting and sleeping ... It's amazing. You can see an animal - 40 kilograms - just resting, waiting for mom." Another interesting (though based on the learned facts, ultimately not surprising) finding resulted from comparing the diets of mothers and their pups. Using chemical analysis from skin samples, the scientists were able to determine that those pups (mostly female) that were at sea consumed more seafood, whereas those remaining with their mothers (mostly male) had a milk-heavy diet. From an evolutionary perspective there must be a reason that a mother invests so much more time and energy on sons than on daughters. And the answer seems to be in the fact that while females ultimately can have but one pup a year, an active bull who has come of age may sire up to four pups each year, thus adding significantly more to the survival of the species. A well-cared for son will have a superior mating capacity and ability. It also will survive to be stronger and thus better able to take care of patrolling and protecting the herd once old enough to do so. 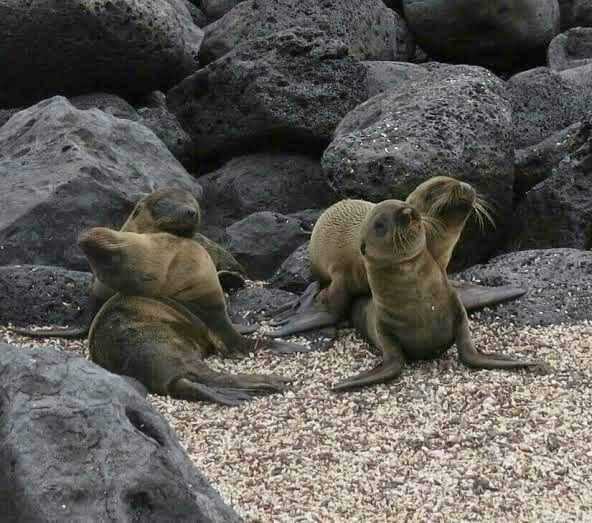 To read more about the burdens placed on a strong bull in adulthood, read my post about the behavior of Galapagos Sea Lions. So, what have we learned about the male sea lion species? It's not necessarily a very complimentary picture. A little boy is born, rather big and definitely lazy. He stays by his mom's side, allowing her to feed and protect him. Eventually he grows up and fends for himself. Then, he becomes the leader of the pack, fighting off other young bulls to get the girl. As the leader, he spends time patrolling his brood of females and babies. And then, when he gets tired, off he goes to his bachelor pad for a nice long period of rest and rejuvenation. When you think about it, on balance, it's a pretty cushy life! 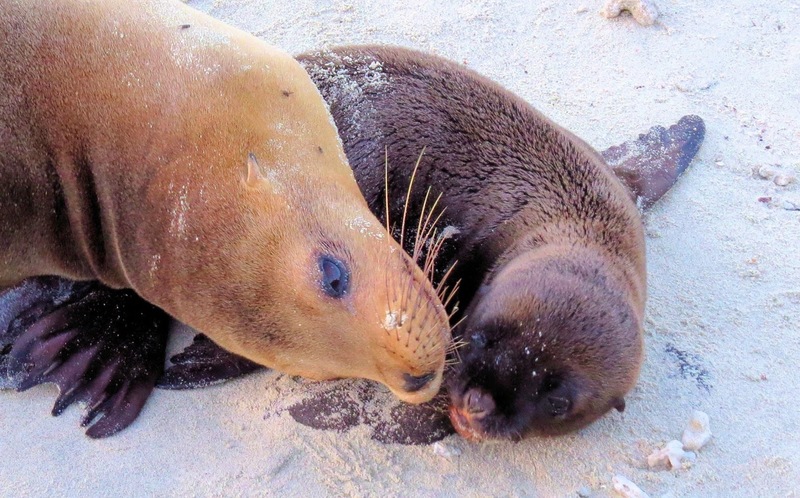 These links will give you more information on the study: Lazy sea lion sons rely on mothers' milk while diligent daughters learn to hunt; Animal Behavior study.